When the caring staff at the Free Range Daycare are forced by urgent business in town to leave the youngsters unattended for a few hours, they are careful to see that their basic needs are met. 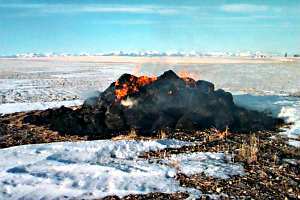 This thoughtfully-laid pile of burning hay-bales will smolder for most of the day, providing warmth and a means of heating the noonday meal. I can see from the little footprints in the snow that the happy tykes have dashed off to the perimeter wire to see what tasty treats the staff have dumped over the fence today. Mmmm, jackrabbit!